My favorite thing about the Super Bowl isn’t the game itself—or even the commercials. I might lose a few points with guys, but I think the best thing about the Super Bowl is the food. 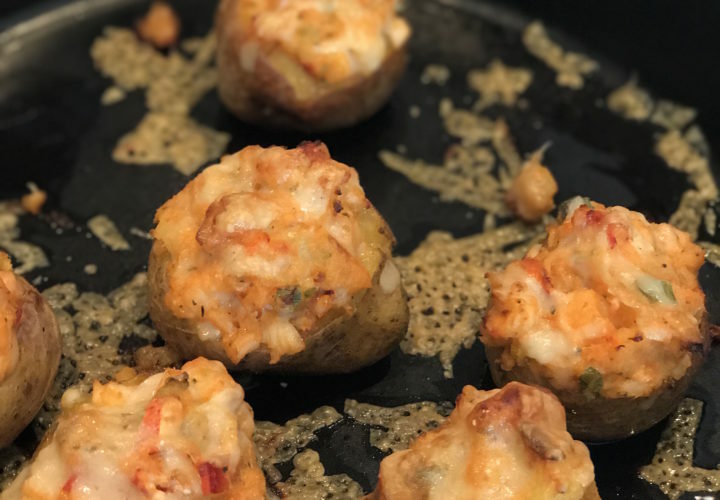 One of my all-time favorite game-time things to eat are these lobster-stuffed potatoes. Check out the video below with my director of communications, Emily and let us know what you think. Twice-Baked Lobster-Stuffed Potatoes from Chef Marc Murphy on Vimeo. Preheat the oven to 400°F; position the rack in the middle of the oven. Place the lobsters in the freezer for 15 to 20 minutes—this will put the lobsters to sleep and calm them down so they’re not so acrobatic when you try to finish them off. Fill a large pot with water and add enough salt so the water tastes like seawater, and bring to a boil. Fill a very large bowl with ice and water. Working with one lobster at a time, in one decisive motion, plunge a chef’s knife into and all the way through the lobster’s head (so the head is halved)—this kills it quickly. Break down the lobster by removing the claws and the tail. Crack open the carcass, and you will find green lobster roe (see Tip). Set the roe aside. Repeat with the other lobster. Discard the lobster carcasses or save them to make lobster stock later. Add the lobster tails to the boiling water and cook for 3 minutes; add in the claws and cook for an additional 6 to 7 minutes; the tails will take 9 to 10 minutes. Remove the lobster from the boiling water and set aside. Once cool, crack the claws and tails and remove the meat. Quarter the tails lengthwise and chop. Cut the claw meat in half and chop it into pieces the same size as the tail meat. In a small bowl or a mini food processor, combine the reserved lobster roe and 4 tablespoons of the butter and mix together or pulse until thoroughly combined. Set aside. Poke holes in the potatoes, place them on a rimmed baking sheet, and bake for about 45 minutes, or until just soft. You can bake the potatoes while you prepare the lobsters. Remove from the oven and let cool slightly; leave the oven on. Cut off the tops of the potatoes and discard. Carefully, without breaking the skin, scoop the potato flesh into a bowl. Mash the potatoes and set aside. In a small sauté pan, melt the remaining 2 tablespoons butter over medium heat and cook until the milk solids sink to the bottom of the pan and turn hazelnut brown and the butter starts to smell nutty, 3 to 4 minutes. Add the rosemary and cook, stirring, until fragrant, about 1 minute. Add the scallions and cook, stirring, for 1 minute. Transfer the rosemary-scallion butter to the bowl with the mashed potatoes and add the crème fraîche, ¾ cup of the Gruyère, the lobster meat, and the lobster butter. Mix until thoroughly combined. Add 1 tablespoon of the heavy cream and mix until incorporated. Add more heavy cream if needed to achieve the desired consistency, and season to taste with salt and pepper. Spoon the potato-lobster mixture into the potato shells and place them in a baking pan. Sprinkle the potatoes with the remaining cheese and bake for 12 to 15 minutes, or until the potatoes are hot and bubbling. Top with the extra crème fraiche and scallions, and serve. TIP: Ask your fishmonger to sell you female lobsters—you’ll need the roe for this dish, but if for some reason, you get male lobsters, just proceed with the recipe as is, minus the lobster roe—it will still be great.